The Leggings 2” WB has a long fitted leg with a 2” soft elastic waistband. 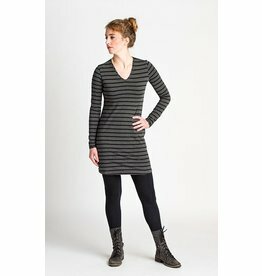 The model is 5’7”, size small, wearing the Leggings 2” WB in Black paired with the Fitted V-Neck Tunic in Heather Grey/Black. The Fleece Leggings have a long fitted leg with a 2” soft elastic waistband. 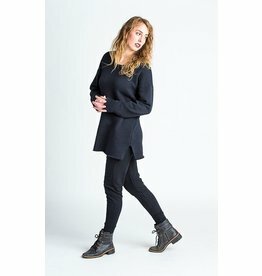 The model is 5’7”, size small, wearing the Fleece Leggings in Black paired with the Crossover Top in Iris. The Terry Tights have a long fitted leg with a wide comfort fit waistband. 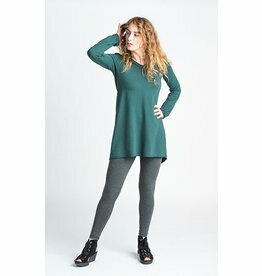 The model is 5’7”, size small, wearing the Terry Tights in Heather Grey paired with the Seekers Tunic in Pine. The Meridian Tunic has a semi-relaxed body with a high boat neckline and a high low hemline with slits at the side seams. Our Model Laura is 5’7” and she is wearing the Meridian Tunic in the colour Grey Flint, paired with the Terry Tights in Black.